Breakout trading can be summarized as getting in once the market starts moving, and getting out when it stops. While simplistic, this is the epitome of successful trading. You cannot make money when the market doesn't move. And the best place to get in is right at the start. Yet, breakout trading seems to have a bad name nowadays. Popular writers like Al Brooks continue to teach that 'most breakouts fail', so it's a bad idea to trade them. 'Wait for a pullback,' they say The problem is that many strong trends don't have pullbacks, or have pullbacks that are late, offering lesser profits. It can drive a day trader mad waiting for a pullback in a strong trend that never happens, while the price skyrockets. It isn't logical to identify a trend start and not enter, waiting for a specific chart pattern to form that may never materialize. The trends on long-term charts and short-term charts look the same, and they are both tradable. But you don't need to trade long-term time frames to be a breakout trader. In fact, the difference is that a day trader has many more opportunities. A long-term time frame trader may catch a trend perhaps only 1 or 2 times a year. A day trader may get an opportunity several times a week. In fact, jumping on a strong, new trend at the start is the easiest way to make money in the markets. So the question isn't if one should enter a trend. The question is how and when. This book provides you with the best strategy for doing so. In Chart , the rectangle defines the range. Bar 1 is a break out bar. But, after the entry, the trend has no follow through, and falls back into the range. Sometimes, this will happen. There are no perfect setups that work 100% of the time. 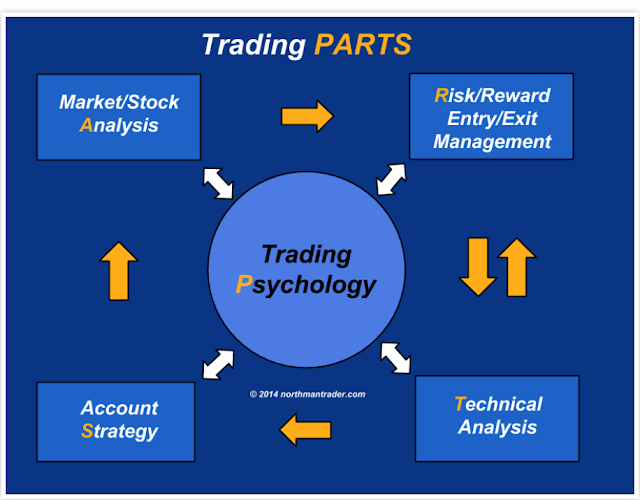 By far, the most important skill you can develop as a trader is understanding the market modalities. This refers to being able to recognize whether or not the market is trending. If it is, there is lot of opportunity. Don't say: “I know all that”. The truth is that most traders know that, yet over 90% lose money consistently. For some time, the market has moved within two, well-defined price points. The price has oscillated between the support at the bottom and resistance at the top. When the price moves this way, the market is not trending. It is in a range. After some time, the price broke strongly through the support and a trend has begun. Notice the red bearish bar that strongly broke the range rectangle. It has closed 'out of the box' and had a size larger than any previous bars in the chart. Where is the trend? Where is the breakout? There isn't one. The price is still moving within two boundaries. (There may be a trend on a higher time frame, but that's another matter that we will consider later.) 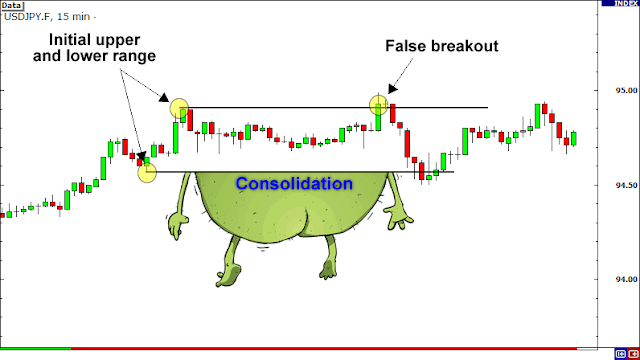 Your job as a breakout trader is to get in once the range is broken, and a trend begins. When the market is still ranging, as in Chart your job is to wait. 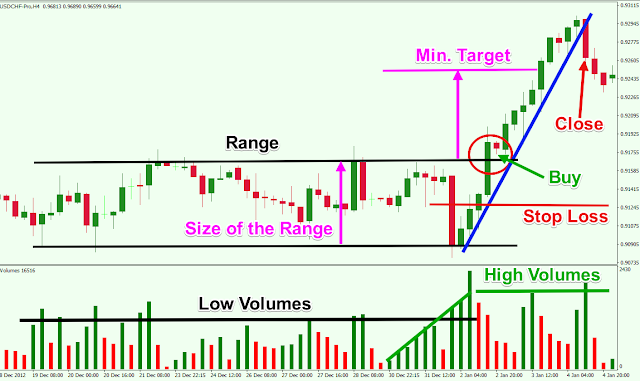 Because trends begin as breaks out of ranges (breakouts), the first skill to master is to identify the market modality. Is the market trending? If not, where is the range? In other words, between which two points has the price been moving recently? You can easily do that by drawing a price rectangle. The top and the bottom should be touching one or several points. Do that on the charts you trade. The rectangle will serve as the primary reference point for the breakout. 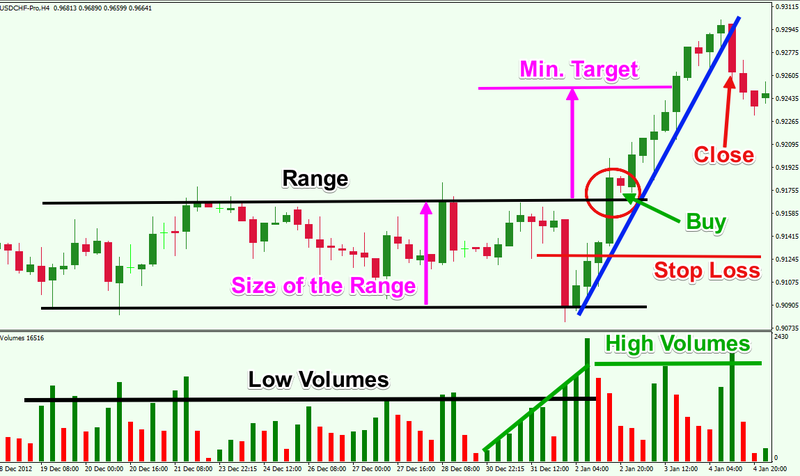 A strong breakout bar that closes outside of that range. The entry bar should be bigger than the bars in the range but not climactic, and have a strong close.All three entry criteria are important, but the most crucial one is . The break out of the range must be clear and convincing (the bar should be bigger than previous bars), but not climactic (the bar should not be disproportionately big). How do we know when the trade hasn't worked out? Clearly, the trade isn't working if the price has reverted back into the range. Typically, strong trends will never return to the range from which they started. Sometimes, the market will test the range and even penetrate it a few ticks before it takes off. So your stop should be inside the range at least a few ticks. I recommend a stop 10 to 15% inside the range. This way, you will not be shaken out easily, but will get taken out when it is clear the trend has failed.